Reading SoHo: Recent Books | SoHo Memory Project. 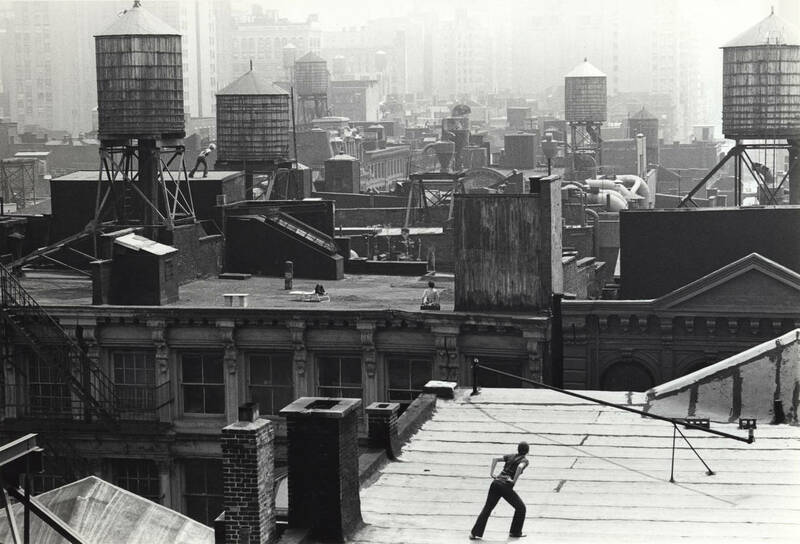 Babette Mangolte, Roof Piece (Trisha Brown), 1973, photograph of Trisha Brown’s Roof Piece performed from 53 Wooster to 381 Lafayette Street, New York City, 1973. Courtesy Babette Mangolte via Flavorwire.com. From Art on the Block by Ann Fensterstock. I wanted to conjure New York as an environment of energies, sounds, sensations. Not as a backdrop, a place that could resolve into history and sociology and urbanism, but rather as an entity that could not be reduced because it had become a character, in the manner that a fully complex character in fiction isn’t reducible to cause, reasons, event. 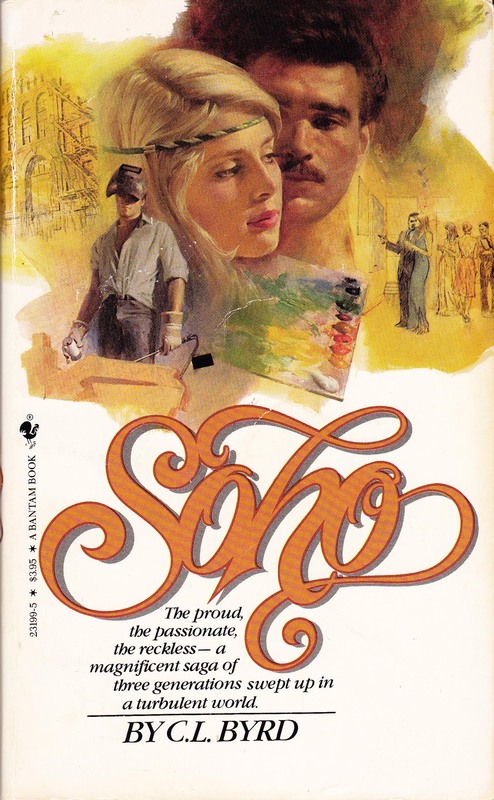 While recently re-revisiting my SoHo book idea that seems forever stuck in Neverland, I was thinking about books of note have recently been written about SoHo. There is, of course, Illegal Living: 80 Wooster Street and the Evolution of Soho (2010) by Roslyn Bernstein and Shael Shapiro, a history of the evolution of SoHo as told through the history of 80 Wooster Street and the people who lived there, as well as Soho: The Rise and Fall of an Artists' Colony (2003) by Richard Kostelanetz, which is soon to be out in a revised edition, among other excellent books that have come out over the years. For a full list of resources on SoHo, click here. There are two brand spankin’ new books, however, published within the last year, that merit particular attention in case they’ve been overlooked by my fellow SoHo memoriticians. 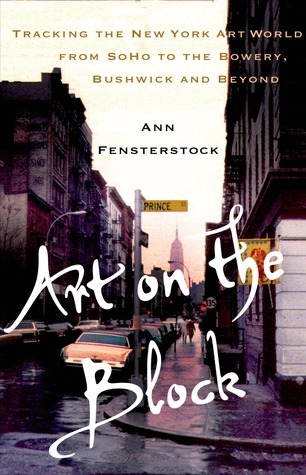 The first is Ann Fensterstock’s Art on the Block: Tracking the New York Art World from Soho to the Bowery, Bushwick and Beyond that follows the evolution of New York’s arts hubs over the past fifty years. 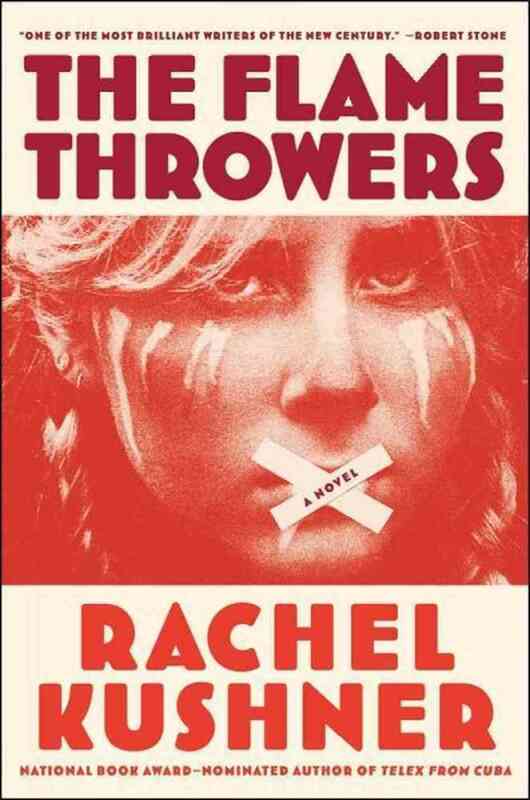 There is also the novel The Flamethrowers by Rachel Kushner, about a young artist who moves to New York from Nevada and then finds her way to Italy where she becomes involved in a radical movement. Although neither of these books focus solely on SoHo, the sections that do are quite compelling and each do their part in shaping our collective memory of SoHo in the 1970’s. Chapters 3-6 of this book are a concise but thorough overview of the development of SoHo from the 1950’s through the end of the 20th century. Beginning with the early years, Fensterstock explains how, due to the influence of zoning laws, the decline of manufacturing, LOMEX, and the specific needs of New York artists, SoHo came into being as a residential and commercial neighborhood for artists and then recounts how the pioneer gallerists of the SoHo art world shaped it into an international destination. When it comes to I pleasure-reading, I tend to shy away from non-fiction, but I found Art on the Block so very readable and engaging. Fensterstock is a seasoned storyteller, and although I felt that some the of sections on SoHo began to resemble shopping lists of galleries and their star artists, I knew who many, if not most, of them were, and I was thus drawn into the orbit of this history. In addition, because this book places SoHo in a larger New York context, with an art world both pre-dating and existing elsewhere after SoHo was no longer a Mecca for gallery-goers, it presents the “big picture,” with SoHo being only one of the many stops on the art train. SoHo is by no means a bit-player in this story, but Fensterstock’s longer lens provides a welcome perspective to my often myopic viewpoint. The year is 1975 and Reno—so-called because of the place of her birth—has come to New York intent on turning her fascination with motorcycles and speed into art. Her arrival coincides with an explosion of activity in the art world—artists have colonized a deserted and industrial SoHo, are staging actions in the East Village, and are blurring the line between life and art. Kushner’s Reno is a diminutive protagonist when compared to the entirety of the New York art world in Fentsterstock, but her world and words are no less expansive. The reader is immediately drawn in to Kushner’s vast landscapes, the Bonneville Salt Flats in Utah, the gritty streets of 1970’s downtown New York City, and the tumultuous streets of Rome filled with demonstrators and riot police, while simultaneously drawn out for a bird’s-eye view. I’m no literary critic, but that seems like one groovy parlor trick. Reno moves organically from place to place in search of the new and the fast, much like the art world does in Fensterstock’s book. In the sections that take place in SoHo, we follow Reno as she experiences loft living at its most glamorous, a raucous dinner party complete with wacky characters and their scintillating conversations, to its most mundane, the brute work of gutting an industrial space of its machinery to make room for art and life, to its most disturbing, a mugging on a desolate street late at night. Kushner’s SoHo is familiar without being predictable, as are her characters. We meet several artists and strivers at various levels if success and renown as well as gallery owners vying for the favor of potential cash cows, all familiar-seeming and perhaps based on real people. Judging from her author photo, Kushner is too young to have lived actually lived it, but she creates characters with authenticity without resorting to the hyper-reality of character types. Reno eventually leaves New York for Italy, where she is invited to drive a race car, and we are introduced to other landscapes peopled with other characters. SoHo is once again one stop of many that Reno will probably make in her lifetime. Anyway, this all is beginning to sound a lot like a college paper, so I think I’ll stop now. My intention here was not to write book reports, but to let you all know that, in case you missed these books, there is some great new writing about SoHo out there. I’ve included a list below of other books I’ve come across in my research. This list is by no means exhaustive so please write in if you know of others! Anderson, Laurie, Trisha Brown, and Gordon Matta-Clark. Laurie Anderson, Trisha Brown, Gordon Matta-Clark: Pioneers of the Downtown Scene, New York 1970s. Munich: New York, 2011. Anderson-Spivy, Alexandra, and B J. Archer. Anderson & Archer's Soho: The Essential Guide to Art and Life in Lower Manhattan. New York: Simon and Schuster, 1979. Attie, Dotty, and Sharyn Finnegan. Better Than Ever: Women Figurative Artists of the '70s Soho Co-Ops. Brooklyn: Long Island University, 2009. Bernstein, Roslyn, and Shael Shapiro. Illegal Living: 80 Wooster Street and the Evolution of Soho. Vilnius, Lithuania: Jonas Mekas Foundation, 2010. Block, René, Ursula Block, and Kurt Thöricht. New York, Downtown Manhattan, Soho: Ausstellungen, Theater, Musik, Performance, Video, Film : 5 September Bis 17 Oktober 1976 : [katalog]. Berlin: Akademie der Künste, 1976. Davidovich, Jaime. The Live! Show. Astoria, N.Y. (35th Avenue at 36th Street, Astoria, N.Y. 11106: American Museum of the Moving Image, 1989. Dolkart, Andrew. Touring Lower Manhattan: Three Walks in New York's Historic Downtown. New York: New York Landmarks Conservancy, 2000. Edelson, Bob. Soho, Nyc. Soho, N.Y: Soho Book Project, 1993. Fensterstock, Ann. Art on the Block: Tracking the New York Art World from Soho to the Bowery, Bushwick and Beyond. New York, NY: Palgrave Macmillan, 2013. Fiore, Jessamyn, and Louise Sørensen. 112 Greene Street: The Early Years (1970-1974). Santa Fe, New Mexico: Radius Books, 2012. Gayle, Margot, Robin Lynn, and Edmund V. Gillon. Friends of Cast Iron Architecture Presents a Walking Tour of Cast-Iron Architecture in Soho. New York: Friends of Cast Iron Architecture, 1983. Gayle, Margot, and Edmund V. Gillon. Cast-iron Architecture in New York: A Photographic Survey. New York: Dover Publications, 1974. Glassman, Carl. Soho, a Picture Portrait. New York: Universe Books, 1985. Gratz, Roberta B. The Battle for Gotham: New York in the Shadow of Robert Moses and Jane Jacobs. New York: Nation Books, 2010. Hudson, James R. The Unanticipated City: Loft Conversions in Lower Manhattan. Amherst: University of Massachusetts Press, 1987. Kahn, Steve. Soho, New York. New York: Rizzoli, 1999. Kostelanetz, Richard. Soho: The Rise and Fall of an Artists' Colony. New York: Routledge, 2003. Robinson, David. Soho Walls: Beyond Graffiti. New York, N.Y: Thames and Hudson, 1990. Siegfried, Alanna, and Helene Z. Seeman. Soho: A Guide. New York: Neal-Schuman, 1978. Simpson, Charles R. Soho, the Artist in the City. Chicago: University of Chicago Press, 1981. Stratton, Jim. Pioneering in the Urban Wilderness: Atlanta, Baltimore, Boston, Chicago, Cincinnati, Cleveland, Dallas, Denver, Houston/galveston, Kansas City, Los Angeles, Milwaukee, Minneapolis/st. Paul, New Orleans, Philadelphia, Portland (maine) San Francisco, Seattle, St. Louis, Tampa, Washington D.c., New York. New York: Urizen Books, 1977. Tannenbaum, Allan. New York in the 70s: Soho Blues, a Personal Photographic Diary. New York: Overlook Duckworth, 2009. Taylor, Marvin J. The Downtown Book: The New York Art Scene, 1974-1984. Princeton, N.J: Princeton University Press, 2006. Taylor, Paul, Timothy Greenfield-Sanders, and Allan Schwartzman. After Andy: Soho in the Eighties. Melbourne, Australia: Schwartz City, 1995. Tricarico, Donald. The Italians of Greenwich Village: The Social Structure and Transformation of an Ethnic Community. Staten Island, N.Y: Center for Migration Studies of New York, 1984. Innaurato, Albert. Coming of Age in Soho. New York, N.Y: Dramatists Play Service, 1985. Kushner, Rachel. The Flamethrowers: A Novel. New York: Scribner, 2013. NY Soho Arts Magazine. New York, N.Y: NY Soho Arts Magazine, 1996. Soho Guide. New York, NY: Soho Partnership, 1994. Soho Journal. New York, NY: SoHo Partnership, 1994. Soho News. New York: Soho Weekly News, inc, 1973. The Soho Weekly News. New York: Soho weekly news, 1973.